Villa Borghese today in the heart of Rome, was the suburban residence of the Borghese family. 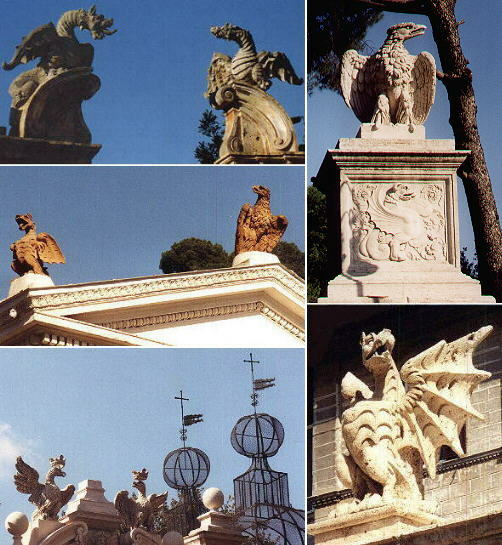 Built in 1616 by the nephew of Paul V, the Cardinal Scipio Borghese, it was surrounded by large and varied gardens, which are still populated by eagles and dragons, the heraldic symbols of the family. The architect of the Casino was Jan Van Santen, a Dutchman known also as Giovanni Vasanzio. He completed a design by Flaminio Ponzio. 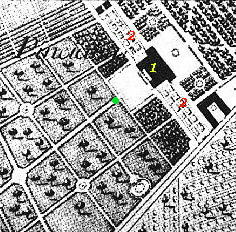 The view is taken from the green dot in the small 1748 map here below. In the description below the plate Vasi made reference to: 1) Façade of the Casino seen from the first precinct; 2) Curtains of trees separating the first precinct from a second precinct where the Casino has another similar façade. 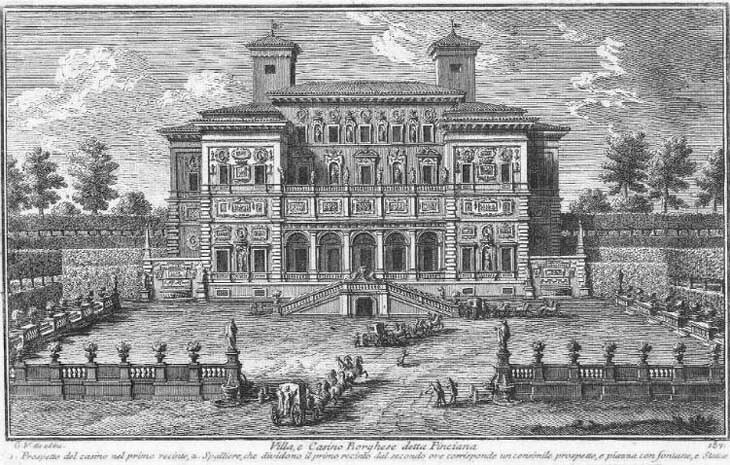 The view over the casino Borghese is today very similar to that of the plate. However part of the very dense decoration made of niches, busts and statues (typical of the mannerists' horror vacui) is lost. Until a few years ago cars were allowed to enter the villa and the square in front of the casino was a parking lot. A recent restoration together with the white color of the building eventually brought some peace and silence. Read Henry James's account of his visit to this site in 1873. Read William Dean Howells' account of his visit to this site in 1908. 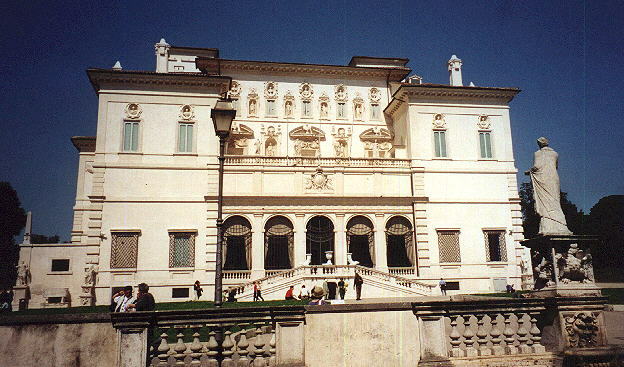 The building now hosts the gallery of statues and paintings which was hosted in the Palazzo Borghese in town. However the statues by Gian Lorenzo Bernini inside the gallery were sculpted for the Casino. Between the busts the reliefs of the eagle and the dragon. Strollers in the gardens are always watched by silent sentinels. For more eagles and dragons see my page on them. The gardens to the north of the Casino are a fine example of a XVIIth century Italian garden, with statues and fountains. The gardens to the south of the Casino were redesigned in the XIXth century when the Borghese acquired other adjoining land and built a new entrance opposite Porta del Popolo. 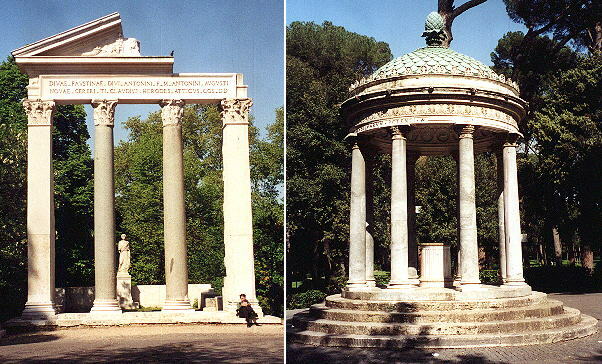 In addition to their heraldic symbols the Borghese, who owned the Villa until the end of the XIXth century, decorated the gardens with little buildings in neoclassical style (here above a fake Roman temple dedicated to Antonino Pio and his wife Annia Faustina and a round temple dedicated to Diana). The gardens were opened to the public and on special occasions the Romans were entertained in Piazza di Siena a sort of open air theatre. 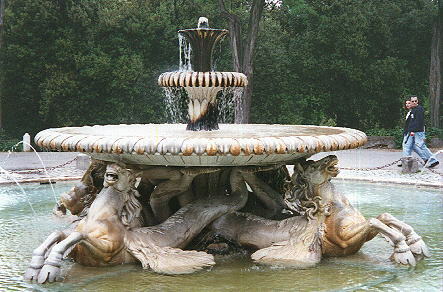 Fontana dei Cavalli Marini was thought by many to be a work by Gian Lorenzo Bernini. It is instead a 1791 work by Cristoforo Unterberger which shows the influence of Bernini well into the neoclassical period. J. W. Goethe was one of the many foreigners who enjoyed walking in the gardens. In particular he liked to sit in a spot near the aviary, which is called after him Rotonda di Goethe. A little pond with a temple to Aesculapius is a late XVIIIth century addition to the amenities of Villa Borghese. The Emperor William II of Germany erected a Monument to Goethe (by Gustav Eberlein), where he is shown with Mignon, Iphigeneia and Faust. 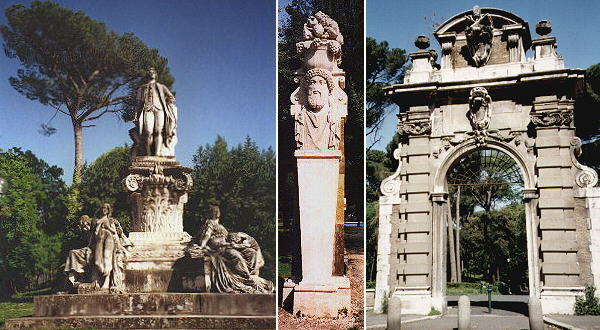 The picture below shows also one of the colossal herms (squared pillars with head, usually of Hermes, on top, used as boundary-marker) in the Italian Garden and the XVIIth century entrance to the Villa in Via Pinciana. 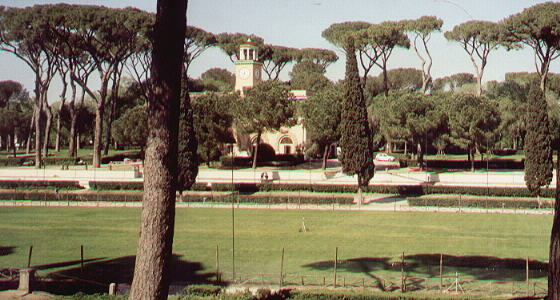 You can see some more pines of Villa Boghese in The Pines of Rome or spend A Sunny Day in Villa Borghese. Villa Borghese Dal Card. 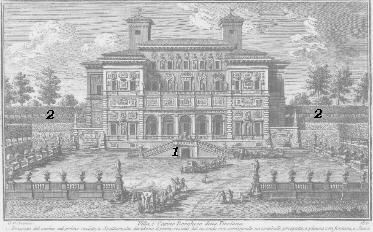 Scipione Borghese nipote di Paolo V. fu eretta questa villa, ed il magnifico casino, li quale darà motivo al cortese mio Lettore di dar fine a questa giornata: perciò lo consegno all'erudito, e garbato Custode, che farà il piacere di mostrargli una dopo l'altra le maravigliose statue, bassirilievi, e busti antichi, e moderni, con altre rarità di quadri, e pitture insigni. Dipoi volendo tornare in Città, sarà bene di trapassare per mezzo de' viali della gran villa ornata di fontane, di statue, e di amenissimi giardini.